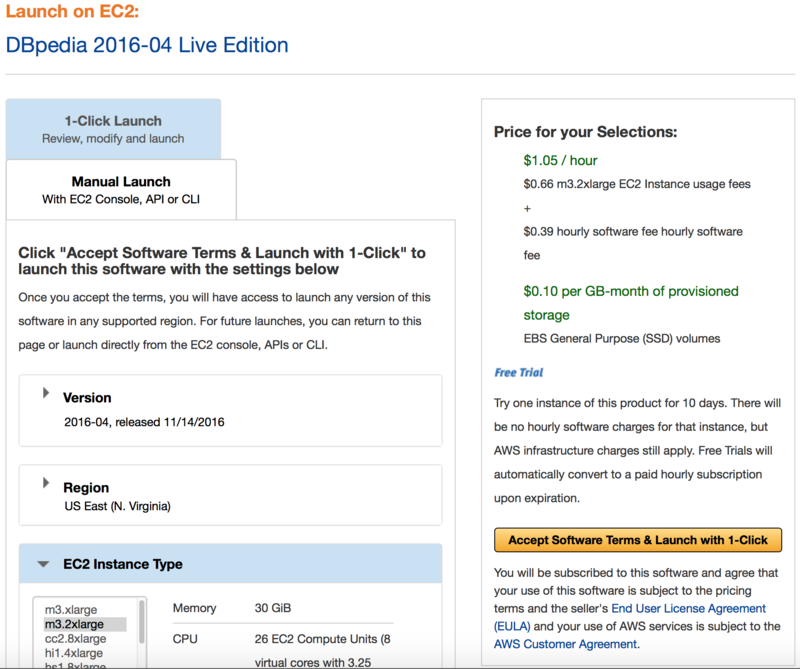 In addition to the Instance-backed EC2 AMI that has been available since 2008, a standard unpopulated Virtuoso instance is available as an EBS-backed EC2 AMI based on either a BYOL (Bring Your Own License) or a PAGO (Pay As You Go) basis. In each case, the AMI delivers a preconfigured Virtuoso instance. We also now offer two PAGO variants, both pre-loaded with DBpedia data. The DBpedia Snapshot (Virtuoso PAGO) (documented on this page) starts as a static instance, preloaded with the DBpedia 2016-10 dataset, mirroring the public DBpedia instance found at http://dbpedia.org/sparql. You can make changes to this data, but it will not track changes made to Wikipedia nor DBpedia-Live. 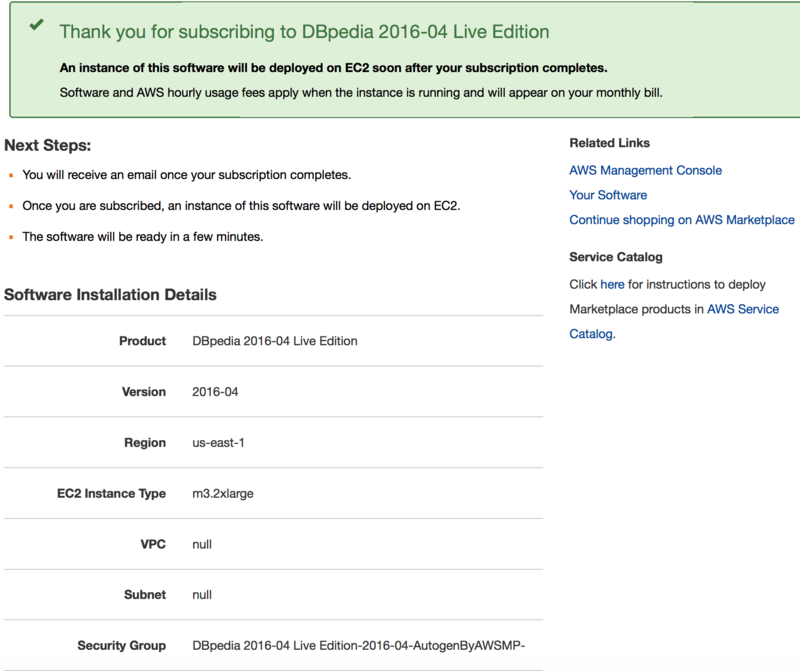 The DBpedia Live (Virtuoso PAGO) (documented on another page) starts as a static instance, preloaded with the DBpedia 2016-04 dataset, and includes an optional switch that enables data updates based on the Wikipedia firehose, effectively giving you a mirror of the public DBpedia-Live instance found at http://live.dbpedia.org/sparql. 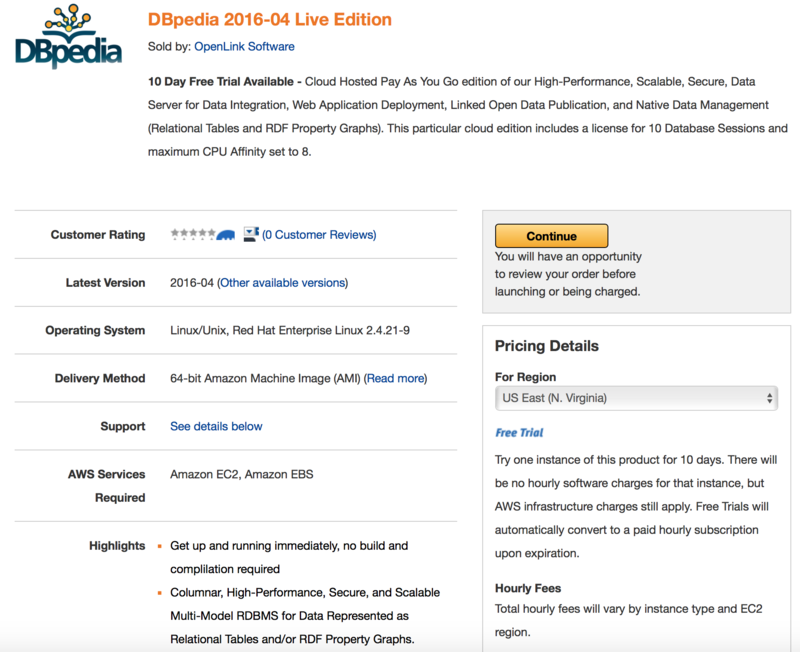 DBpedia Dataset is preloaded and preconfigured (and may be configurable to auto-update). You can start and stop the DBpedia instance without having to terminate its host AMI. With the hourly model, you pay only for the time the AMI is used. Locate the DBpedia Snapshot (Virtuoso PAGO) image in AWS Marketplace and click the Continue button. Choose a suitable size EC2 Instance Type and Key Pair, then click on the button Launch with 1-click button. A confirmation dialog will be presented indicating the image has been deployed. Check the in the AWS Console EC2 images Web Interface that the image has been successfully instantiated. These steps in this section are only necessary the first time you start the Virtuoso instances on the AMI. This section may be ignored thereafter, as it is not necessary after AMI reboots. There are two Virtuoso instances in this AMI. One which comes up quickly, with no significant content, so you know the AMI is basically functional; and one which comes up more slowly, with the full DBpedia dataset, which takes significant time to start due to some Amazon requirements for such AWS instances. If you do not see a running instance, execute the following commands, and then repeat the command above. We strongly recommend you now use the Conductor to change the password for the 'dba' user from the the AMI instance-id. If you get any error at this point, execute the following commands, and then re-try loading the Conductor in your web browser. At the authentication challenge, log in as the dba user, with the AMI instance-id as the password. Note: If unable to connect to the Virtuoso server using the instance-id as password, please register with our Support Site, and create a Support Case for fastest assistance. Drill down to System Admin → User Accounts. Locate the dba user, and click the associated Edit link. The form allows many things to be changed. For now, just input your desired password into both Password and Confirm Password boxes, and click the Save button. You can now perform other administrative tasks through the Conductor interface, or return to basic use. Start the Virtuoso DBMS Server against the DBpedia Database by issuing the commands below. Note: At initial launch, it takes the Virtuoso DBMS Server approximately 20 minutes to bring the DBpedia database online, due to its size. You can now perform other administrative tasks through the Conductor interface, or return to basic DBpedia use. The OpenLink License Manager must be launched before you launch the Virtuoso instance, and must remain running at all times for Virtuoso to run. Set the Virtuoso environment variables by running the command below. Note: This does and must start with dot-space-slash. Run the Virtuoso "isql" command line tool to connect to the database. Note: your EC2 AMI's instance-id will be the dba user's password, until you change it (as recommended above). 209 Rows. -- 1890 msec. This AMI includes a bundled Virtuoso license which enables 10 Database Sessions and the use of 4 logical processors. Licenses that upgrade these attributes are available as paid upgrade options. Virtuoso always takes full advantage of the memory it's configured to use. This may be much less than is found in its host environment/AMI. This AMI is pre-configured for an m3.large EC2 Instance Type, so will use 7GB of RAM. If you choose a larger EC2 Instance Type (such as the recommended m3.2xlarge), then the NumberOfBuffer and MaxDirtyBuffers parameters in the /opt/virtuoso/dbpedia/dbpedia.ini configuration file should be increased to correspond to the chosen Instance Type's available memory, as detailed in the Virtuoso Performance Tuning Guide. A few examples are shown below. After changing these or any other settings in the INI file, restart the Virtuoso server as described above. There are a wide range of AMI choices, offering various combinations of system memory and logical processors. To improve performance, use an EC2 Instance Type with more memory and more logical processors. To make use of additional processors, you will need to also acquire an upgraded Virtuoso license.